Home » Why Is My Dog So Fat? How To Keep Your Dog Slim And Healthy! 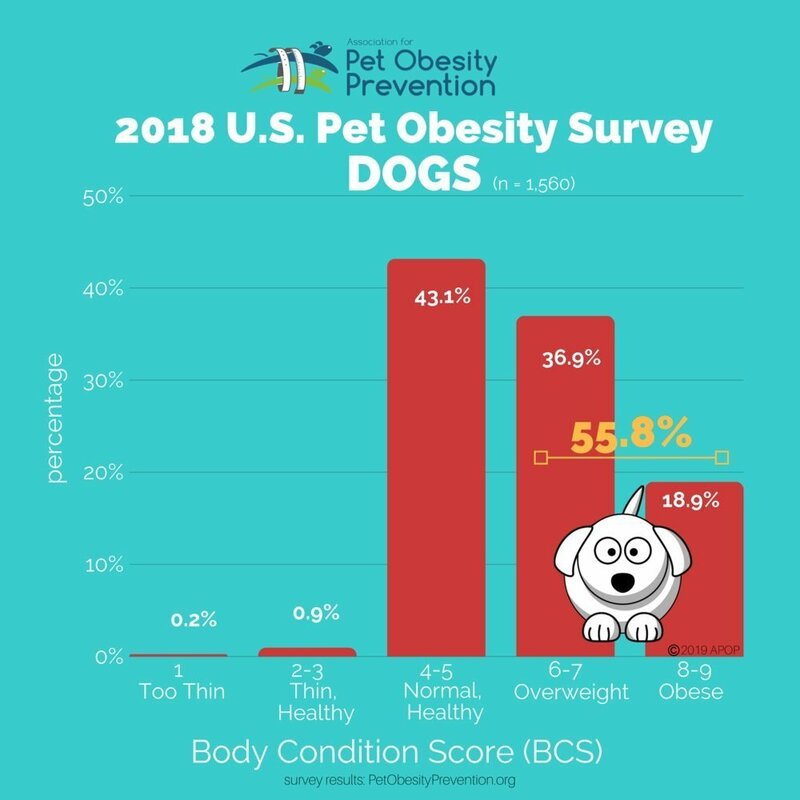 More than half of the dogs in the US are overweight or obese, according to the latest survey made by the Association for Pet Obesity Prevention. 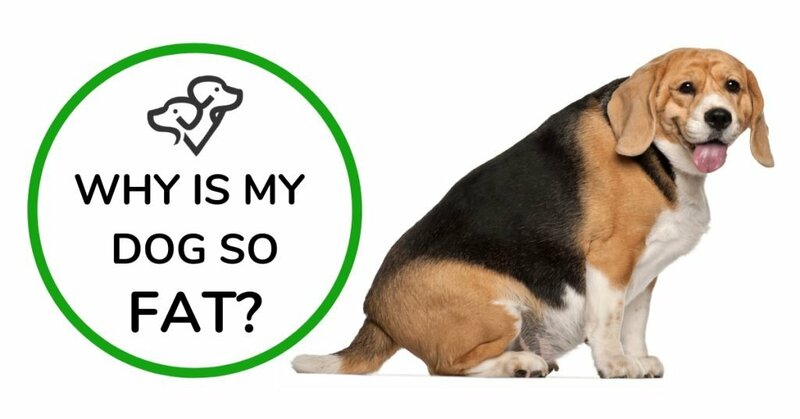 With this article*, I will help you understand what makes a dog fat and what the dangers of being fat are for your dog. I will also help you understand how you can keep your dog slim and healthy. You will also learn how to easily decide if your dog is overweight or not. If it has already accumulated a few or more pounds too many, I will suggest how you can help it return to the size and shape it should have. Remember, you are the only one who can help your dog do that! If you have already asked yourself “why is my dog so fat?”, you are on the right track. That you are here, reading this article, is a great start! Good news, this is the easy part! All you need is your eyesight, your hands and some common sense. The spots on your dog’s body you need to check are the ribs, the tail base, the abdomen and waist. 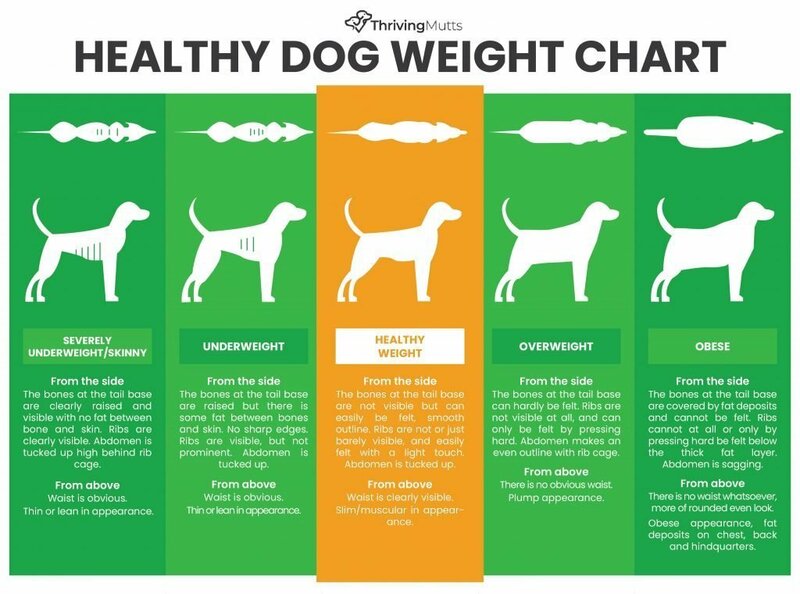 For your convenience, a healthy dog weight chart for easy reference when checking your dog! Start by looking at your dog from above, when she is standing up. You should be able to clearly see a waist. If the outline is even with no or hardly visible waist, she is overweight. Now look at your dog from the side. The abdomen should be tucked up behind the rib cage. If it’s not, she needs to lose weight. If the abdomen is sagging, she is obese. Now turn to the ribs. They should be easily felt beneath skin with no sense of extra padding. It’s okey if you can just about see the ribs, but if they are prominent your dog is actually underweight. Now what about the tail base? The outline of this part of your dog’s body should be smooth, with no protruding bones. But, when stroking the rear end of your dog’s back with a light pressure, you should be able to feel the bones. If the bones are visible, she is underweight or maybe even skinny depending on how sharply the bones are raised. To summarize: Your dog should have a clearly visible waist and a tucked up abdomen. Ribs should be easy to feel when pressing lightly on the sides of the body. The bones at the tail base should not be visible but easy to feel when gently stroking the area. Got a dog with a lot of fluffy fur? Then use your hands to feel through your dog’s body and make sure there is a waist and the tummy is tucked up. Check out below in the video how vet Zara does it! Every time I see a clearly overweight or obese dog it makes me really sad. Because the poor dog has no say in it. It can’t say no to all those goodies it’s being fed. It doesn’t know that eating them is detrimental. But also because the owner feeds those table scraps, treats, bad dog food and maybe even donuts to her/his dog because she/he thinks the dog actually will be happier. Dogs are biologically speaking wolves. Hard to imagine that a 4 pound chihuahua needs the same food as a 100 pound wolf, isn’t it? Still true though. Feeding your dog food that contains a lot of grains and corn is not a healthy choice. The high carbohydrate content causes a lot of insulin to be released into the bloodstream. Insulin tells the cells to store calories from the food as fat. So-called light foods often contain a lot of carbohydrates as a replacement for fat. The insulin response caused by the carbohydrates in these types of food can actually make the dog store more fat and gain weight compared to a food with the same calorie content but with a higher amount of fat and proteins. Species correct food for dogs is high in protein and with a naturally high fat content. Sounds like grain-free food with a lot of meat to me! It’s sooo hard to resist those begging brown eyes at the table. Look at him, he must be hungry, poor thing! Don’t fall for those begging brown eyes! Please don’t fall into that trap! Begging at the table is learned behavior and has very little to do with actual hunger. Those extra little bites at the table will only make your dog gain weight. Also, food for human consumption is NOT what a dog should eat. Treats can be of good use when training your dog to come on recall for example. Read carefully on the label and choose a treat that is without sugar and high in protein. Treat tip 1: buy chicken or beef jerkies, use a pair of scissors and simply cut them up in small pieces to use for training. Healthy treats that your dog loves! Treat tip 2: use the kibble as treats. Dogs love food, they have no concept of treats. That’s human thinking! If you’ve been giving your dog a lot of treats during the day, you need to make that night’s serving of the regular food somewhat smaller. Treats are food too! Free-feeding is sometimes recommended as the natural way to feed your dog. In my opinion, free-feeding (leaving a bowl full of food available at all times) is making your dog a huge disservice. First, it’s nothing natural about having food freely accessible. In the wild, wolves may go without food for days if their hunt is not successful. When they finally manage to kill a prey, they eat as much as they can. Translate this behavior to free feeding a dog, and you most likely end up with an overweight and unhealthy furry companion. If your dog suddenly starts to gain weight and/or has an increased appetite, always make an appointment with your vet for a check-up. There might be an underlying medical issue that needs to be dealt with! For example, a dysfunctional thyroid gland can cause weight management problems. A hormonal disorder called Cushing’s disease makes the body fat redistribute to the tummy, giving the dog a pot-bellied look. Other symptoms are a dull coat, a stiff walk, heavy panting, and lethargy. 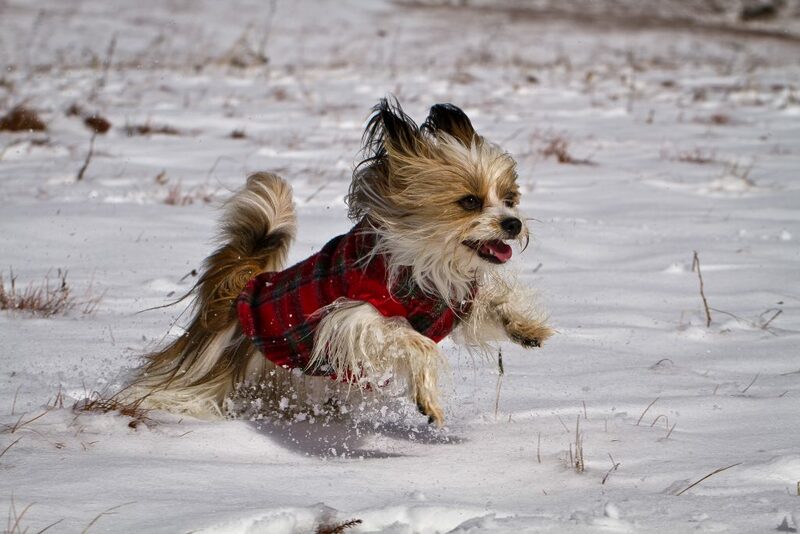 A dog needs to move every day to stay healthy and happy. 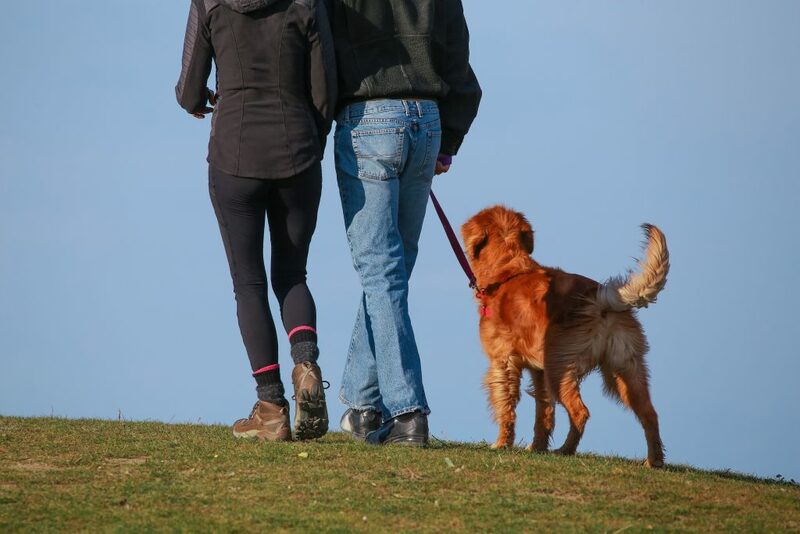 Have your walks slowly diminished to 5 minutes around the block merely allowing your pooch “going to the loo”? No playing anymore? In combination with an unhealthy food choice, and feeding table scraps, you’re setting your dog up for severe overweight and poor health. 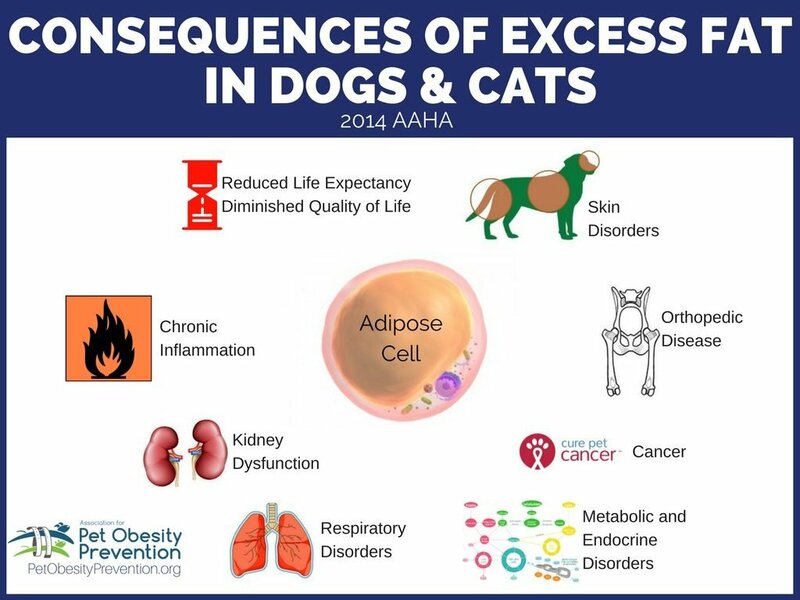 When you allow your dog to become overweight or obese, you’re putting it at risk of developing plenty of serious medical conditions. Not what you want for your sweet pooch, right? And, you can be sure that your dog will die at a younger age than if it had a healthy weight. As if they don’t have short lives as it is. So if the dog in your life has gained a few or more extra pounds, it’s time to help her lose them. Give the two of you as many high quality years together as possible! First of all: contact your vet and make an appointment to make sure there is no underlying disease that is part of the reason your dog is fat. Also, ask your vet to help you calculate how many calories your dog needs per day at her ideal weight. This is individual and depends on the size of your pooch and how active she is. 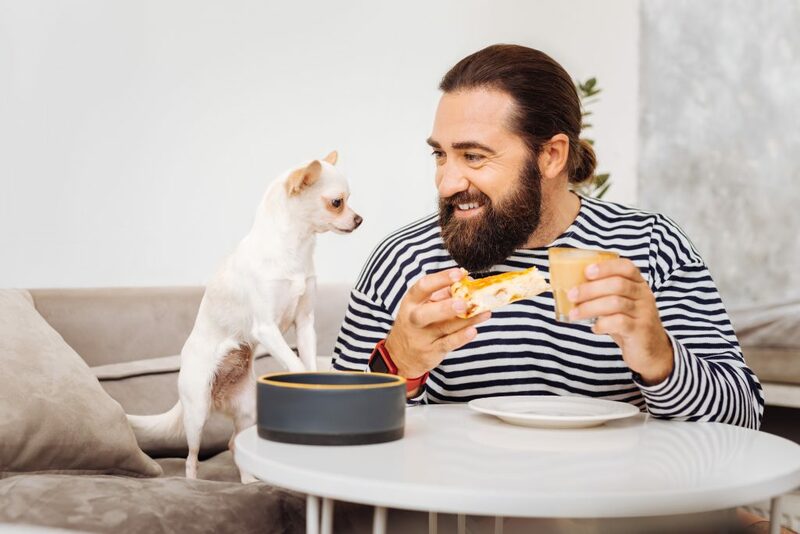 Next step is to make sure you’re feeding a high quality food to your dog. Most importantly, make sure the carbohydrate content is as low as possible. Please, avoid so called light food. They are usually high in carbs replacing fats. That’s not a healthy diet for a dog. You don’t need a diet or light food to help your dog lose weight. All you need is a nutritious and biologically appropriate dog food served in the proper amounts. Check the label for the calorie content in the food you use. You need to know how many calories there are per ounce or per kg. Do you have a kitchen scale at home? No? Then go out and buy one! It’s a cheap investment that will help you to be so much more accurate in how many calories you actually serve. Using a cup and measuring the volume is not good enough, especially for small breeds. Only a few pieces of kibble to many per day could mean several ounces of added weight per year. Remember, dogs need to lose weight slowly, so don’t fall for the temptation to serve less than the calories needed for the ideal weight. Losing weight too fast might cause liver failure and other health problems. Now closely monitor your dog in the coming weeks. Make it a habit to look at and feel through her body once a week. If the months go by and no weight loss can be seen, scrutinize yourself on what the reasons for this might be. Are you still feeding her those extra treats from the table (she looks so hungry/sad/yearning!)? Or are you “guilt-treating” to relieve yourself of some guilt when leaving home? If so, stop it! You’re projecting your own human feelings on your dog. That’s not what she needs. What she does need is you stepping up and taking responsibility as her caretaker. Make your dog move! Take brisk walks, short at first. Make them a few minutes longer each week, until you walk briskly at least 30 minutes per day. However, not all dogs enjoy walks, the stress of meeting other dogs can be too much for them. My Lola is like that, terrified of dogs she doesn’t know. In those cases, playing is also an excellent way of exercising your dog. A few minutes a few times a day goes a long way. You may also try and find places where there are few other dogs. Does your dog have a dog friend? If so, let them loose (in a safe place!) and watch them run around happily. Why not do it right from the beginning? Actually, what is said above of how to help your dog lose weight is also what you should do to help your dog stay slim and healthy. Provide high-quality food, serve it in the right amounts, don’t guilt-treat your dog or secretly feed her from the table. If you want to use treats during the day as rewards, make sure they are healthy. And remember, treats are food too! You have to count them in when calculating how much you serve at meals. Make sure there is physical movement each day that makes the heart rate increase (why not in both of you?). If possible, walk in uneven terrain to develop the muscles. Give your dog a species appropriate dog food. Don’t give her anything else! Make your dog move every day. Walk, play, swim. All varied movement is good! Keep an eye on her body, using the healthy dog weight chart above. Are the ribs becoming harder to fee beneath the fat, lessen the servings by perhaps 5%. Realize that a dog is biologically speaking a wolf. Human food, including cookies, donuts, pasta, french fries and whatever else you can think of, is bad for them. Period. Keep your dog slim, healthy, exercised and happy, and enjoy your life together! *Please note: The information provided in this article is in no way a substitute for professional veterinary advice or help.